Type 1005 coated single line tubing is ideally suited for instrumentation and process control lines. It is the original plastic coated metal tubing. Available in 1/4'', 3/8'' and 1/2'' O.D. sizes with wall thicknesses ranging from .030'' to .035". Withstands corrosive atmospheres found in many plants. The PVC or poly- ethylene jacket protects the core tube from chemical attack. 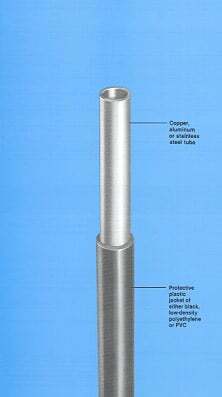 Electro-Galvanic Action Prevents eletro-galvanic corrosion which could occur if the copper or aluminum tube contacted other metals. This is especially important in moist areas. In areas in which tubing is subjected to vibration or impact, the tubing jacket acts as a cushion.